Stamps At Play: STAMPlorations Giving Thanks Blog Hop and Linky Party! 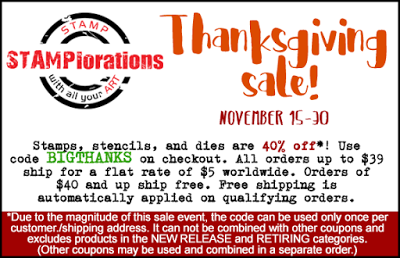 STAMPlorations Giving Thanks Blog Hop and Linky Party! Today starts STAMPlorations 3rd annual Giving Thanks Blog Hop and Wishlist Linky Party!!! Get ready for oodles of inspiration, fun and chances to win prizes! You'll get all the deets HERE. ...PLUS, how'd you like a FREE WORD/PHRASE DIE ($10 value)? When you place your order and use the BIGTHANKS (40% off) coupon code, put in the notes section that you saw this deal on my (KATHY'S) website and tell Shery which FREE WORD/PHRASE DIE you'd like!!! Great card! Love the scarecrow!! Fabulous Fall card design. Love the scarecrow. Love the cute scarecrow, beautiful card! Cute scene you created. Love the background. So cute-I love that scarecrow. I am digging that background you made. It is lovely. The scarecrow and leaves and pumpkins all come together to make a scene that is really cute. the 'thankful' die (& that it's one piece). Such a fun card, Kathy! Your scarecrow, standing in the midst of the pumpkin patch and falling leaves, is delightful! Another fabulous showcase of YOUR creativity with STAMPlorations products! Cute Fall card. Great coloring and I like the background. Such a vibrant, fun card! I love this colorful fall card! What a fabulous card, Kathy! Great background and coloring. Wonderful, Kathy! I love the inky background and that sweet scarecrow! That's such a great fall card ! I love your background ! gorgeous card :) love those fall colors. Happy thanksgiving ! I love that fab background on your lovely fall scene! Beautiful colors and love the background! Gorgeous Card!